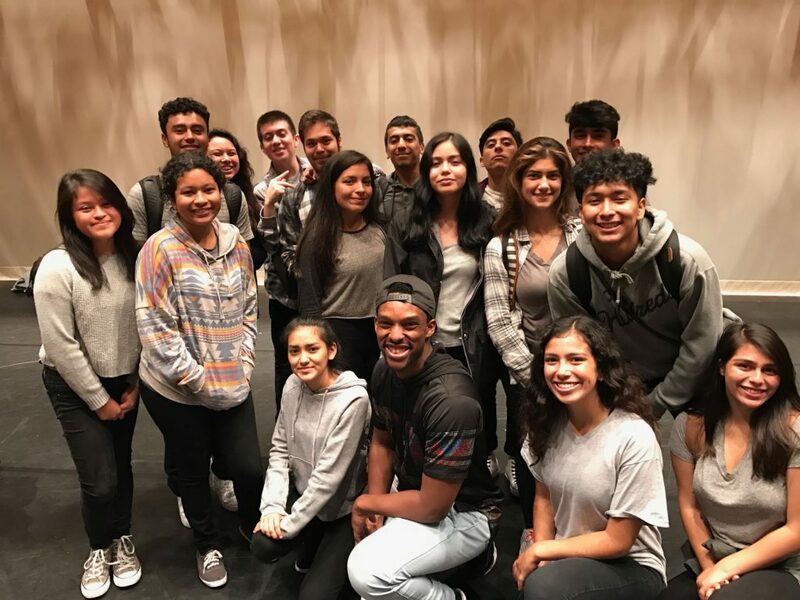 In October, Versa-Style, an LA based hip-hop dance company, brought urban dance into the classroom for a week-long intensive with students. Together, they created performances based on themes from the novel. 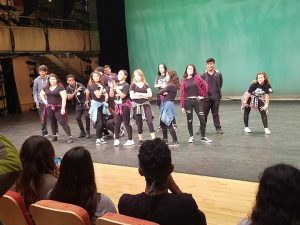 In keeping with the idea that creativity can be derived from drawing parallels between unexpected fields, students connected their twenty first century identities to their understandings of the Victorian era, through dance. In book 4, we see how altercations and egos can occur within a family or families. It is really amazing to see how at this particular time, families still face this kind of problems. At the dance intensive, all in my group really touched on “egos” and “problems” when talking about “what is family to you?” We start to see occurrences of egos and problems when the two wills were found. When a strange gentle named Joshua Riggs came out of nowhere, that caused a disturbance because people were wondering who he was. Only Mary knew exactly who he was. That’s like being at a family reunion and someone who hasn’t been with the family in a long time randomly pops up. Everyone is in awe just like how everyone in Middlemarch feels. The problem with Mr. Riggs randomly coming out of nowhere is that is starts to cause confusion as to who you are, and why are you here feeling? Everyone that has appealed to Mr. Featherstonw feels they’ve done a lot to get that will money that Mr. Featherstone has left behind. Families in the 21 century still experience the expectations of something they feel they’ve worked for. In this case it’s money or property. Characters like Fred, Mr. Vincy, Mrs. Cranch, Mr. Waule, and Riggs all have the expectations of something in return. Not everyone received something and that’s where the commotions start to occur. I think that the message is how the world has been taken over by materialistic influences. You can see how problems can link a family together once you look at the brighter side. The narrator shows the gradification of how small things(egos, selfishness) can disrupt a community of people. The distinction of reality of fantasy. Are you going to be upset when you’re not satisfied or are you going to look at the brighter side of things? The larger question to me is how do you battle your alter ego when your are influence by experiences that lead to certain expectations? Would family be family with or without egos? Can egos harm or bring family together? Last but not least, being a dancer is like being a leader because they both require patience. You have to be calm with what your doing, it takes time. You have to aware of how to tackle things like dancing and reading. It takes a special kind of focus to master them both. Both of these things do causes frustration, but it also requires a certain understating of how you have to put your pride aside to actually understand what you are reading or doing. Just like a marathon, you have to pace yourself especially with dancing and reading. In the dance intensive, my group and I came up with words that come up to mind when we think of family. One of the words I saw there was ‘complicated’, and tied to complicated was drama and problems. And in book 4 that is something we see a lot of. In chapter 29, we see that between Dorothea, Cassaubon, and Will, there is some conflict going around. Will tells Dorothea that Cassaubon has forbidden Will to go to his house. Dorothea of course didn’t know of that. Will believes that it was wrong of Dorothea to marry Cassaubon and he describes their marriage as a “dreadful imprisonment.” Because of this, Will plans to stay in Middlemarch, Dorothea tells the news to Cassaubon and he isn’t happy about it. He writes a letter to Will, saying that he should leave Middlemarch. While that’s happening Mr. Brooke is having his own problems with Mr. Dagley. Mr. Dagley tells Mr. Brooke that he’s a terrible landlord and that the whole estate believes he’s a bad man. In a community or family, resolution is an important part but before a resolution happens, problems and conflict need to happen first. Not all communities are fine, some have more drama then others. During our dancing intensive for Versa Style, we had to incorporate what family meant to us. My crew “legacy” came up with positive and negative outlooks when we think of the term family. Although we might think of our family is known for always being there for us, and being loyal, there are times when it can cause a lot of choas as well. This sort of warm up connected us with Middlemarch. In book 4 we can see that there is a lot of choosing between family, Will, Cassaubon and Dorothea. As we know, Will is developing a crush on Dorothea and that creates suspicion for Mr. Cassaubon. This creates tension between the family members Will and Cassaubon,since he writes a demanding letter to Will to leave Middlemarch. Cassaubon mostly blames the reason he should leave by saying that he isn’t suited for the career he has right now. In addition to all this, it creates a bit of more choas when Dorothea implies to leave his will onto Will. Dancing and reading are related by having to tell a story. Dancing can signify many things, just as books do as well. Being a dancer you have to find the rhythm in certain things, just as a reader has to find the meaning behind certain things as well. A big thank you to our versa style instructors, I genuinely enjoyed myself in the few sessions we’ve had. One of the most memorable moments during our versa style intensives was when we each individually wrote what family meant to us or the elements within both a functional and dysfunctional family. As far as the A.K.A’s go I believe that we’ve all got one whether we are aware of it or not, an A.K.A could translate into our passions these “street” names if you will provide us with a chance to be someone else without judgement or criticism which is what I think Dorothea was trying to achieve when she married Casaubon, the marriage to him served as her A.K.A, she was able to dig into and expand her knowledge freely once she had married him and Mary Anne Evans also had an A.K.A (George Eliot), she took on the name because she knew it’d be nearly impossible to produce a book as a woman in her time, taking on this new name allowed her to create what is now one of the most important books in English literature. Being a dancer is similar to being a reader in that each activity can be interpreted differently sometimes even if people are reading the same book they can still be producing a completely different scenario in their mind and when we watch a performance or take part in one we can also be connecting to it in a completely different way than the people around us. Some key words and phrases used by crew to define family were love, extended, brother from another mother, sister from another mister, blood in blood out, complicated,invasion of privacy,and taquitos and horchata. To many of us, family was not limited to the nuclear family: mami, papi, brothers, and sisters. In chapter four of Middlemarch, love gets complicated. A love triangle is formed between Mr. Cinnabon, Dorothea, and Will. Relationships get dull and people get ready to mingle. but why always Dorothea? “Was her point of view the only possible one with regard to this marriage?” This quote shows that everyone has a point of view. Family is subjectively. I’m not much of a dancer but now I feel like a professional. Thanks berry groove and precise. During the dance intensive with versa we got to express and experiences what family is for each individual person. In my opinion each family has different types of obstacles and different ways of approaching certain situations. The most important thing about family is that they are always going to be their for you when you need someone but in order for that to happen there may be a lot of disagreements that leads to complication, drama and people having their ego system higher. This ties into MiddleMarch Book 4 because there are conflict between Dorothea, Will, Cassaubon, Featherston, Fred, Vincy, and many others because first Will forbidden Cassaubon from his house while Dorothea has no clue of that situation. Wills opinion towards Dorothea wanting to marry Cassaubon is wrong because Will is planning to stay in Middlemarch but Cassaubon writes a letter to Will saying that he should leave. As to the rest of the middle marchers, Mr. Featherston had a will left behind and Fred, Vincy, Cranch, Waule,and Riggs feel like they need something from the will that was left behind, but Mr. Featherston leaves 10,000 pounds to Fred and his land to Riggs. As we can see in this situation it does not seem like it is going to end up well because in our time today it is all about the money and getting out something from others. Many people tend to know that certain situations are not able to be fixed right away because many people tend to get mad and have a high ego with one another. A way that dance helps express people’s’ emotions is by the movement they tend to do and also the face expression they show while dancing. Our dancing intensive with Versa Style had us thinking about family. While reading through Middlemarch, one connection I found is with Featherstone and Fred Vincy. Featherstone used Fred as a way to torment his real blood relatives, since they were so selfish to only care about inheritance. The promise of money was an important factor to Fred and his family. Instead, Featherstone leaves his property to an illegitimate son and no money to Fred. As you can see, money meant family. Mary was the deciding factor into which will would be used, after using the second will leaving Fred with no money, the narrator said, “Mary too was agitated: she was conscious that fatally, without will of her own, she perhaps had made a great difference to Fred’s lot.” Despite being childhood friends (or one can say, family), she decided it was best to give Fred no money. Ultimately, money is what drove families together and/or apart. You could see the strong sense of community in chapter 34 between Celia and Mrs. Cadwallader and Mrs. Cadwallader and her family, “ ‘I’ll go anywhere with you, Mrs. Cadwallader,’ Celia had said; ‘but I don’t like funerals.’ ‘Oh, my dear, when you have a clergyman in your family your must accommodate your tastes:’” You can see how Celia is making adjustments to her lifestyle for Mrs. Cadwallader, as for Mrs. Cadwallader, she’s doing the same for her family as well. We accommodate ourselves at times because we see we don’t need to be selfish, at times we need to make sacrifices because it’s better for the family or community that we are in. Those sacrifices in the end will help create stronger bonds with one each other. Just like how when we were dancing we were able to create stronger bonds with each other because we had to get out of our comfort zone, which in this case was the sacrifice, in order to make our dance look amazing. Some got out of their comfort zone more than others but they still made that sacrifice happen. The way dancing and reading are similar, is that for both of them it’s better if you have a community to support you along the way, as well as that you at times have to break it down into small pieces so that you can learn from it better. What me and my crew came up with when the word family showed up to our dance intensive was trust, chaos, hope, care, etc.”The Jokers”,we came up with that name because that day we were just saying random names ,but we did not agree to them , but we were laughing ,For example nayib was saying the “yibs and and the others”and we were just dying of laughter saying that that one was for sure not on the list.In book 4 we see how their is family of Featherstone gathered to be at his funeral and how Joshua Rigg is to take the name of Featherstone.Most of the characters from book 4 expect something in return like fred, riggs,will and Casaubon.In conclusion the dance intensive has showed me that signs can represent things in a way that not everyone gets. During the beginning of my crew’s (legacy) dance there is a contradiction of movements and to me I see it as fighting and arguing. The idea is family through out the whole dance, and with this first movement you can picture an actual family because there is and always will be conflict in a family. We can connect this first dance movement with no other than the now new family which is Dorothea and Casaubon, in book 4, and they have recently being having conflicts. Casaubon is not happy with how Dorothea and will have been getting along and so it evolves to arguments within both of them. However as my crew continues with the dance you see a shift where we then become one and grow closer with each other. In the book, Dorothea and Casaubon have an argument and push themselves away however Dorothea pushes away her logic because she still care about Casaubon and they both care about each other enough to forgive ones actions. Family are people that no matter what you do or what happens they will always care for you and forgive you without you having to show it.they accept you without condition. 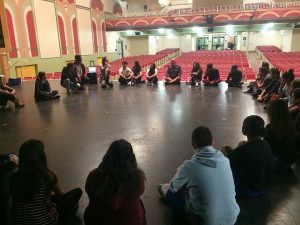 A dancer expressed their feelings through dance and music but can also create a bond with the people around him or her, Like a reader they create bonds. A reader can relate to a character as a dancer can relate to movements, both gain something new. In the concept of family, a couple of my teammates had the word together and what that signifies in a family. On the spot we came up with the idea that a family should be together through good and bad times which is different from the type of family that Dorothea and Casauban portray. (Trust) In order for a family to stick together through all times, they need to have a well informed system of communication in which Dorothea and Casauban do not have. When Celia and Mrs. Cadwallader are looking at the funeral and see Will Ladislaw, it immediately sets the narrator in the tone of two voices shifting back and forth. Voices shifting back and forth are not the same thing as a dialogue between two people shifting back and forth. When the news is dropped that Ladislaw is back, Dorothea starts thinking about what her husband might be thinking about at that moment and Casauban is thinking about what Dorothea’s intentions might be with Will and what might have happened when he fell ill but he won’t bring it up because of his pride. In this sense, Dorothea and Casauban have an argument without actually communicating, symbolizing how they are far apart unlike the unity of a family. Another important characteristic that I think was implied by Versa Style was trust, one of the dancers mentioned how he had been dancing with the other dancer present for eight years and they are comfortable around each other. I believe what the message really was, was that there is trust, no matter what mistake you make, there will be no judgment but there will be help. In my dance in particular we noticed that every time someone was lost, they would look at someone else and then we were all back on track. This was a sort of silent communication because we got our point across without speaking, with ideas, unlike Dorothea and Casauban because although they too had ideas and were not speaking, they did not have facial expressions or movements because they were in front of guests. Mr. Brooke has absolute trust that Will Ladislaw is a great man and will be a fine secretary, he compare him to “Hobes, Milton, Swift-that sort of man” (Book 4- page 330) which if we recount back to Book 1, it is exactly what Dorothea was wishing to find in a husband, it would be a great honor to take care of a man such as Milton. Mr. Brooke has the trust that Will can become a “Milton” which might show that Dorothea chose the wrong man to marry. If I was to describe book four with one word it would be family. In book four you are introduced into a love triangle between Dorothea, Cinnabon, and Will. Which causes a lot of conflict within their families. Although that’s what family is. Thanks to Versastyle I have a different understanding of what family is. Before family was just people who you share the same blood with but now to me it’s much more. Family doesn’t have to be who you share blood with. It can be who you bond with. Family doesn’t exist due to your bloodline it’s their because of what you do. A family fights, argues, love each other, take care of each other, fight for each other, and much more. And throughout this short time with Versastyle I have been able to see that. They had us separated into groups and we made our “crew” and “crew” name. We chose “The Get Down Crew” and at first I thought it was just a name and that it was just some dance, but as we started to write those words to describe family on that piece of paper I started to realize so much more. I was blown away by how much I was able to learn. So thank you Versastyle! “Swiftly moving clouds only now and then allowed a gleam of light up any object, whether ugly or beautiful, that happened to stand within its golden showers.” I think that this connects to our discussion of “family” because I see the “object” reflecting situations and how the circumstances might be ugly or beautiful, but no matter what it is, as long as you “stand within [your] golden showers”, which I see as family, there will always be that light that will shine, which I see that represents happiness. I think this is very important in connecting with dance because sometimes your actual “blood-family” can be the “ugly” object, but with your crew you have this amazing family that really brings out the shine in you. In other words, through Versatile I have learned that with dance you can create bonds that will be forever appreciated. Sometimes you can have tough situations that may get the best of you, but when you dance I feel that all the bad vibes go away because you are letting yourself become this different character who has no problem what so ever. you can call it a stress reliever or an escape to your problems, but the reality of it is that dancing, just like reading, can take you to a whole other world and its through your crew or your “family” that allows you to feel so free and so comfortable in this other world. In book 4 Dorothea states “I am fond of knowing something about the poeple I live among… One is constantly worrying about what sort of lives people lead, and how they take things” (p. 326). This quote shows us a new perspective of Dorothea on her community and how Dorothea wants to learn more about the people around her which ties into the theme of book 4 which is perspective and seeing. The idea of family here makes the reader wonder how the world is in other people’s point of view, and Versa Style gave us a new perspective on how we view family. Family doesn’t have to be blood related, you can find trust and comfort in other people when you both have something that you’re passionate about. Taking this dance intensive and being put in a group and picking a crew name showed me exactly this. When you are a dancer you have to be open-minded when learning new dance moves and also when you’re around new people, that is just how a reader is when reading a novel and when coming across a new character. Dancers take what they learn in a different point of view which is also what readers have to do to fully grasp a novel’s message. The last time we had our dance intensive we were divided into two groups, group one and two. We came together and decided our name, The Jokers. We were then assigned to think of words that come up to mind when you think of family. We came up with so many words and didn’t realize how many connected with each other or how many contrast each other. Throughout book four in MiddleMarch we can see how family isn’t all about love but hate. The jealously between Casaubon and Will keeps growing is something we think a family doesn’t go through but many family’s love to compete against each other. Casaubon knows better and he knows family can stab you even though you guys are family so he asking Will to leave because he id capable of taking Dorothea away from him. Being a dancer can relate to be a reader because when you dance there is always a meaning behind that. If you pay close attention to a dance you can read their dance and see what their message is. My crew and I came up with different words and key points of what family means to us. We decided to name our crew Legacy and in one of the words we came up with, we also decided to incorporate opposite words, for example, forgotten. In Book 4, it starts of by saying “…May was not always warm and sunny, and on this particular morning a chill wind was blowing the blossoms…” This reflects upon the ups and downs within a family. In a family, there will always be problems and obstacles which will to have to be overcome. Some may be tougher than others but in the end family will always stick together because nothing can ever break that bond and come between it. These obstacles arise as tests to see how strong families are and it’s supposed to unite one another because working together will make the team stronger. Yet family can be beyond being “blood related.” People come and go but the ones that stay, have a deeper bond. The bond which is created develops its own root and flourishes a new beginning and a new story. In Book 4, as well as throughout Middlemarch, we see a lot of troubles arise within the families. Dorothea and Casaubon have many issues within their marriage and an important issue was communication. They did not communicate the way there were supposed to and the bubble kept getting bigger and bigger until it popped. She began to develop feelings for Will which she try to ignore but eventually it became harder to do. In dancing, everyone has to work together and understand one another in order to tell a story as well as bring the piece of art to life. When you’re dancing, you are taken to another place and your body takes over to create movements. This links to being a reader because when reading, one is also taken to another world in which we step into different character’s shoes and engage in a story different from others. A story is being told when dancing and as a reader, one is reading different stories being published and performed. During our experience with Versa- style , it taught us how family can not only be described as a support system or , just annoying brothers but that family can break time barriers in the sense in the connections I was able to make with my Family now and the Families in MIddle-March. In my dance group we talked about how families have are ups and downs and we described our family by if be put a positive adjective describing family we would also put a negative adjective as well. This activity help us connect Families to the book because of how there’s conflict between Casaubon and Wills family and how jealousy can get in the way of this. Also Versastyle talked about have families get through the good as well as the bad , and that even though you are not blood , this doesn’t mean you can’t be family. This Finally leads to my last topic of discussion that we all have different ways of dancing and this all makes our family unique and if you pay attention to every single dancer even though they might be dancing the same thing , they can all be telling a very different story from the person next to them. I would like to thank Versa Style for dedicating this past week to us, and teaching us the importance of Dance. History is always important and like any other dance genre HipHop has its own origins, which relate to the central idea of dance- Family. Family is being in unison as a collective, supporting one another in the ups and downs, advocating, motivating and welcoming just like the Versa style has been. For my group we came up with the name “The Jokers” and the significance is that even though all families go through disputes, argument, miscommunication and difficult times, at the end of it all as a family we will come together with a simple laugh and resolve all the differences. The notion of families are linked to togetherness and overcoming obstacles as one force. Families can often be tested and challenged to figure out if your family will actually be a family will stick around in thick and thin or just when it is at their convenience With the quote describing Featherstone’s funeral on book 4 “This funeral shows a thought about everyone: it looks well when a man wants to be followed by his friends and if they are humble not to be ashamed of them”(334). Funeral bring families and friends together no matter the conflicts in between During this moment families share grievances and memories of the loved one who passed away. It is a moment of forgiveness and unison where they can all relate and understand each others sadness. Class status, ranked, gender, ethnicity, beliefs are not facts that should separate people especially families . Families are meant to be a life support with unconditional care and love with mutual feelings. It is a give and take situation for balance and equality. For instance a directly opposite example of a true family would be the relationship of Rosamund with Legate, where she the wife is very demanding and materialistic and thinks that the male is meant to serve her as she pleases. Although, this should not be the way that family s should be they should always remain loyal and defend each other. Dance is very much like reading in a sense of delivering a message about the story being told. Every move in dance has a purpose and energy that is release to have an effect on the audience of feeling. reaching involves close reading and so does dance we have to pay close attention to every move and the music because those are the foundations to that industry which carry meaning and importance. In book 4 we are introduced to a chapter full of families. We were able to see how back in the 19th century most families has a egoistic problem. This is interesting to see because problems such as the ones the families in Middlemarch were experiencing are problems families now in the 21st century are currently experiencing. While working with Versa Style, we were asked “What does family mean to you?” The recurring topics of “problems” and “judgement” were mentioned in both groups, but although both the 19th century families and the 21st century families have problems we are able to see through our dancing that a family is more than just problems and judgement, family is unity and support. The depiction of family and how they all have egos, allow us the reader to see a larger picture of ourselves. As individuals we all have egos and our egos affect our families. One connection there is in being a dancer and a reader is that as both you will see connections, patterns, and repetition. Both a dancer and a reader have to keep track of patterns they see within the book and their dance. Within their dances they are dancing and the book they’re reading there is a stronger connection of both having to focus on the repetition of the dance steps and the book plot. Last week we had the awesome opportunity to expresses our feeling regarding the meaning of family to everyone by our dance intensive with Vera Style. Everyone in my group had a different perspective of the meaning of family, as everything in the world family isn’t always perfect therefore not all the definitions of family were positive. When talking about family, as a class we came up with the idea that family doesn’t not always have to be blood related because sometimes friends or one’s community become a family. Just like in Middlemarch Book 4 “Three Love Problems”, the theme of family and community is mentioned/pointed out a couple of times. “We don’t mind how hard the truth id for the neighbors outside our walls. I think we have no right to come forward and urge wider changes for for good,until we have tried to alter the evils which lie under our own hands.” This quote shows how Dorothea wants to help her neighborhood and helping has become part of who she is and her character in the book. This example was also used in Professor’s Gould commercial and it’s mind blowing that regardless the large time gap there are many connections that we are still able to make. In this case, we could see how important helping her neighborhood became to Dorothea, they in some way become like her family someone her cared about. When we were dancing, my group was like my “crew”/ my family because we have spent some much time together that bond of family has created among us and that genuine feeling of care is present. Trust played an important role when creating our dances because we had to trust each other that we could all put in our best effort to make the final dance come out as perfect as possible. Vera style taught us that it’s always important to trust each other because trust makes a huge difference at the end. Being “dancers” and “readers” are much alike because both take a lot of effect and focus to either learn the steps or to understand what is happening the book. To come to a full understanding of the book one has to put in the best of one’s effort as well as when dancing, to make the perfect dance it takes a lot of effort, commitment, and focus to make it work out on the long run. The concept of family through Vera Style and family in Middlemarch is a connection that one might have not thought of but it’s a great connection that links to different time periods. In our Dance Intensive, we were prompted to create a team name according to the idea of a family. My team came up with the name, The Jokers mainly because we just cracked jokes while we came up with ideas. And that brought the idea of the different characteristics or “idea words” that a family describes. We came up with things like, Comfortable and Familiarity. We had positive idea words at first but then we came up with words that describe the more negative parts of a family. Words like Jealousy and Expectations and many more. We figured out that a family isn’t always good or isn’t always bad. In our session of this great opportunity, dancing with the professional dance company Versa Style has been an amazing experience, but it had also made me realize the art of dancing. The art of dancing is similar to the art of writing in that both works are choreographied through the synergy of the writer and dancer to their movement of body and pencil. It is the intuition of the mind that creates the dance in the stage and the passage in the paper. However, both works are also similar in that they subtly represent an object that is subjected through an action, a statement of the artist that can be interpreted in many ways. Perhaps that is what the art of dancing is and art in general, whether its performing in stage or writing: it is being subtly enacted by the artist so that the audience can interpret what the work is. In addition, dancing and writing are both influenced by life experiences; where the form of art subtly or explicitly represent the subject of what is being enacted and that is how and when the audience interprets. In our dance intensive we did just that, we incorporated from our life experiences of “what is family?” to our dance. While incorporating the meaning of family into our dances, we were divided into two distinct dance crews. In my crew we were called “The Get Down Crew” and the other crew became “The Originals”, this allowed us to connect further with each other that our dance crew became a new family. We then wrote our name in a poster and then wrote a series of words and phrases about what family means to us. With every word in the poster it creates another ingredient, a fragment to the meaning of family. Likewise, writing is similar in that it is influenced by life experiences, but as well as it connects to the reader and audience with the intention of stating the subject in the use of life experiences. For Instance in MiddleMarch we can see, as the reader, that the subject in MiddleMarch is not only the position of characters in which they confront their problems, but it is the setting, the time period, and everything else to which George Eliot wrote as her influence for MiddleMarch. I believe that is why the art of dancing and writing is so similar because they have the ambition to receive interpretation from the audience through what has been experienced by life. Throughout the session I was really happy to dance, while learning at the same time that every work is comprised of family and the experiences of having a family. Thank you Versa Style dance company, this was an amazing opportunity and a fun intensive. During the dance intensive we were asked to write down key words that we believed connected to the word family. Three keywords that we wrote down and that I feel also connects to Middlemarch are “distance”, “betrayal”, and “try”. In chapter 37, Will tells Dorothea about how after his father died Mr. Casaubon thought that it was “his duty to take care of [Will and his mother] because of the harsh injustice which had been shown to his mother’s sister.” This ties into our keywords “distance” and “try”, because it shows how there was a great amount of distance between WIll and Casaubon but because they are family he tried helping him as much as he could, when Will most needed it. This shows how even if you might not be the closest with your family, you should always be there for eachother when you most need it, this is something my group and I discussed. In chapter 42, It is described how Casaubon was certain that “ Dorothea was the cause of Will’s return from Rome” and that if anything “Dorothea had innocently encouraged this course.” This demonstrates how Casaubon feels betrayed by his family, his cousin and wife. In really life many times families do betray each other whether on purpose or accidentally. Special thanks to Versastyle for incorporating dance with the idea of family and the idea of family within Book four. During the Dance intensive, we were split up into groups. Within those groups we had to come up with several ideas that tie with the word Family. My group came up with several amount of words and phrases that range from positive to negative on a family spectrum. These words and phrases that we came up with, show up a lot in book 4,whether it was Complicated, Drama,Love, individualism and unity all having this strong connection. We see in book four that those words fit perfectly in. From the family of the Cassaubon’s, including Dorothea and the addition of Will. We see this chaos when Will is banned from going to Cassaubon’s house. Creating this weird complicated drama among the family because of Will’s Feelings toward Dorothea while she is married to Cassaubon. All together they have this conflict bubbling but indivually they are also going through things themselves alone. This chaotic beauty of family complications was shown to us through dance. We saw how groups of individuals can have solos while still being apart of a bigger picture, still being part of a family. Being a dancer and a reader, you start to realize that choreography tells a story, you put what you read or what you interpret into something vivid, alive, and moving. In the dance intensive we brainstormed words that related to family such as : Judgement, acceptance, and loyalty. Middle march has plenty of examples of how difficult family can be sometimes. In book one we see how Dorothea is being judged by her family. Her family doesn’t support her decision to marry Cassaubon, Her sister Celia and uncle don’t think highly of Cassaubon, your family doesn’t always accept the decisions you make and sometimes they judge you for it, this is what happened to Dorothea and Fred. In Fred’s case he got himself into a debt he couldn’t pay back on his own. As a result he ended up dragging down the Garth’s with him, to Fred the Garth’s were like an extension of his family and because of his irresponsible spending Fred lost some of their trust, the Garth’s judged him for gambling but they stuck with him anyways because they were loyal to him. The word family doesn’t always have a positive connotation. Being a dancer is like being a reader because through both forms you feel strong emotions they’re just different forms of expression. With Versa Style, we were able to derive definitions of what Family means to us. We came up with words leaning away from the ‘usual’ or ‘cliché’ ideas of what being a family means. In my group, we derived an overall definition of family that defines as different expressions of individuality but in the end every individual is one all together. “Divided but united.” Like wise, in Chapter 34 of book four, in the conversation Celia and Mrs. Cadwallader are having, Mrs. Cadwallader states “Oh, my dear, when you have clergyman in your family, you must accommodate your tastes: I did that very early”(page 325). After stating this, she clears it up with her own “accommodation” when she married Humphrey in which she “made up [her] mind to like sermons, and [she] set out by liking the end very much.” With her example, we, along with Celia, can see that in Mrs. Cadwallader’s family, there are individuals with their own interests, but in the end, as she states, they are one together in which the end is being liked. A connection between a reader and a dancer would be the whole notion of a story. This means that as a reader is reading the novel, their imagination is unfolding images, hints in regards to the story. Simply they are putting the storyline together in their head. In dancing, a dancer has a story to tell in many cases, and to do this, the unfold and embrace every step and every count to be able to put their storyline together and tell their story. Thank you Versa Style for engaging us in the experience of hip hop and teaching us how to tell our story of what a family means in a dance. During our dance intensive we were placed into a group and discussed what family meant to us and how not having the same blood doesn’t mean you aren’t family. Some of the key words we came up with were positive and some were negative because there are times when family members can be on good terms or create a disaster. In book 4 we see family drama between Dorothea, Will, and Casaubon. For example, Mr. Brook believed that Casaubon will be happy to know that he hired his young relative, but Casaubon isn’t so happy because he never liked Will, especially not now that Will begins to have a crush on Dorothea. Will looked for Dorothea and asked her for advice whether he should stay in town to work for Mr. Brooke. When Casaubon finds out he isn’t happy about Will’s intention so he begins to write Will a letter that this profession isn’t the for him. When Will receives the letter he responds back to Casaubon and tells him to mind his own business and plans on staying. This creates many problems to the family, but which family doesn’t have problems that can’t be resolved. 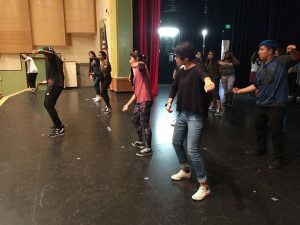 Dancers create different dance moves to perform a story like the day we went to UCLA and saw Versa Style perform, but a reader also tells the audience a story. They both send out the same message whether it’s by dancing or writing. Being a dancer is connected to being a reader in a way that they have an intention of understanding a certain message but have different ways of expressing it. Dancers are able to express their message with specific steps and movements that can represent the actions in their message while readers can understand words and perceive them in a different matter than everyone else and can represent them with more words or speech. Through our Versa Style intensive we were able to experience the true meaning of family, I say we because my dancing group (Legacy) needed to work together in order to clearly represent our dance routine, but this is what family is truly about; Working together, understanding one another, and being able to communicate through different means in order for us to fully express our dance. The representation of family in our dance can truly represent the contrasts in families, we have a movement where it seems as if we are bickering but towards the end we had the ability to come extremely close and represent our dance as a family.People’s individual relation towards society can be depicted through our character Dorothea and through dance. Dorothea does not believe in marriage and that is out of our social norms and then we have dance that has people moving in different directions but personally everyone has their own dancing standard they want to achieve for themselves and not others. Words such as “love” and “hate” are very contrasting especially when these words are tied to the concept of Family. These of course are not the only ones, when we think of family we think of support, bonds, friendships, motivation, acceptance, and unison but something good is always accompanied with something bad in order for there to be a balance. When we think of family we don’t think of a perfect structure because family can be judgemental, disappointment, tensions, betrayal, tensions and separation. In our choreography, I began to see the similarity between our words and our dance moves. We were separated in half within our crew and we would do the same steps but a different order or sometimes we would do the same steps or we would come close or separate. Almost like in Middlemarch, that everyone knows everyone but that doesn’t mean they are all family, and all the chaos, betrayals, and disappointment from just one community is being acted out by us as dancers because families are found everywhere. “Young Ladislaw, he was sure, meant to defy him and annoy him, meant to win Dorothea’s confidence and sow her mind with disrespect, and perhaps aversion, towards her husband”(pg.375). Casaubon feels jealous, and almost betrayed by his own family. In this case Casaubon and Will are blood related and they are linked through blood but they aren’t very fond of each other, and Dorothea is the one that challenges this link between Casaubon and Will without even realizing it; becoming a love triangle. Lastly being a reader and a dancer are very similar not only because both end in “-er” but also because when you’re a reader you become a part of the book, you somehow see yourself in the book and can feel what the characters are feeling, being a dancer allows you to do the same thing by really connecting with movie and becoming a part of music and really feeling it as well. During our versa style intensive we were able to see that music and dancing isn’t just something to do when you’re bored, it is a way to express emotion and tell a story. Our group, also referred to as “crew”, was asked to come up with a definition of family. Of course it wasn’t simple but we described family as the ying and yang. There’s a good and a bad side. Through our dancing we did opposite dance moves to show a contrast or the “bad” but we also came together to show how family overcome or the “good”. In book four of Middlemarch we are able to see this idea of family towards the end with Dorothea and Casausbon. Although they had been arguing over jealousy and they were furious with each other, Dorothea came back to Casaubon. When she realized he is what mattered she let go of all the negativity and focused on the positive. When he noticed she had been waiting for him he realized he should let go of the bad as well. That is what I believe family is about, it is about the good outweighing the bad and although families go through tough time they are always there for you at the end of the day. “I am fond of knowing something about the people that i live among, said Dorothea, who had been watching everything with the interest of a monk on his holiday tour. It seems we know nothing of our neighbors, unless they are cottagers” This quote shows the community as a whole and describes what Dorothea is thinking, for example displays the communication among the community as Dorothea references the mentality she is having. In book four family is depicted as strange at first as we start to realize how the characters are changing among them selves, as Professor Gould has said how Mr Brooke is blind to the fact that he hasn’t served his community well and now that he has realized that he isn’t beloved by much people as he though him self as. so this in with the first quote shows that family is challenged in this case im using the community as family, they face the challenge to change which i believe is the most difficult thing to achieve as in any family. Dancing and reader both share similarities because they both create inspiration through expression, dance shows the physical aspect of creativity while being a reader shows the expression through diction in which promotes passion in ones thoughts. they both are alike because they both show expression and make the viewer or reader feel alive based on the enthusiasm the “speaker” presents. Contrasting ideas of what we thought family meant were shared during the Versa Style intensive. Our group, the legacy, expressed the idea of the ying and yang within families; there is good in the bad and bad in the good. This same concept can be applied not only in our own personal life, but also in the families of Middlemarch. Most of the “bad” or defects shown within the Middlemarch families is money. Money acts like a blindfold and can also be hurt those whom are considered family. Featherstone almost flaunts his wealth from the grave when his family members are informed that they didn’t receive his inheritance, instead, a young fellow named Joshua Riggs inherits it. This decision saddens Fred because Fred was initially supposed to inherent, most, if not, all of Featherstone’s belongings. This shows how money can play a key factor in determining the “bad” in terms of a familial aspect. In book four unity as a family is highlighted and in middle-march family was defined similarly to how in versa style we discussed family. A crew or a family defined in terms of us is very similar to the 19th century. A family that we defined is united but also there is splits similarly to that of Dorthea and her family. The dancing in hip hop crews keep people united and under a proud name, like my crew is named Legacy because we leave a footprint in this world but within a legacy there is faults and disagreements just like with Dorthea and Casaubon and Will had their disagreements. First off I’d like to thank the versa style team and taking their time to teach us some new grooves. Our dance ideas such as the notions of family relate to the novel Middlemarch for the reason that sometimes we don’t really know who family is until a tragic events happen. For example at Featherstone’s funeral a new funny looking person arrives and appears to be Mr.Riggs whom is apparently Featherstone’s illegitimate son. This shows sometimes we don’t really know who family is until we all unite. Bringing our dance intensive in the way that my crew name is “Legacy” and our theme is yin and yang (Opposites). An opposite represented in Middlemarch is the same example I used. Sometimes we know who is our family but we really know who is actual family when there is a tragic event. Also, dance and novels are similar in the way it’s different for every person. One thing I learned from the dance intensive is that everyone has their specific or unique groove. Same goes for writing. Comparing George Eliot (Mary Ann Evans) and Dickenson, both have different styles of writing. Finally, from this intensive came another new experience, an experience with friends learning how to get our groove on and to have fun.